Comments Off on Why should SME leaders map out their ideas, information and projects? 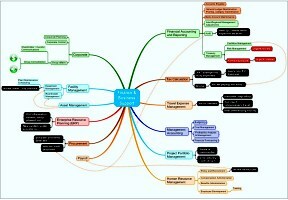 Posted by Roy on Nov 13, 2013 in Mindmapping, Planning, Thinking | Comments Off on Why should SME leaders map out their ideas, information and projects? Do you lay out ideas visually, instead of in a list or bullet points? Increasingly, business planners are using this technique from decades ago, as it gains popularity. If you have a flow of ideas for a new product or service, see if this works for you: Lay them out in a map that shows how they are connected. It frees up the thinking and often suggests new connections, and that’s something a list does not do. When you are collecting information for a complex task, information maps can help you sort it in a way that shows related themes together. Most of the time that turns out to be much more useful than an alphabetical or date-sorted list. Combining these two can help with the first project planning stages and go through to project management. Software like MindManager, MindGenius, MindMapper and MindView can all take dates that you have entered and produce Gantt charts for progress planning and some, using plug-ins, can produce ‘dashboards’ for at-a-glance project control. Some people really like the freedom of the hand-drawn type of map. They do suffer from inflexibility when a task or project undergoes change – then they are often hard to change and add to. 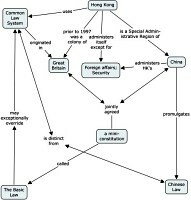 Concept maps can be useful for analysis of a topic. The last type is most often used in business – my experience as a management consultant is that business leaders find them more serious-looking and easier to read than hand-drawn or Buzan style maps where the reader often has to twist the paper (or worse, their head, if the map is on a screen). How do I ‘map’ these things then? In a brief article a useful ‘how to’ would not be very useful, but fortunately there’s WikIT, a wiki that is all about this type of mapping. 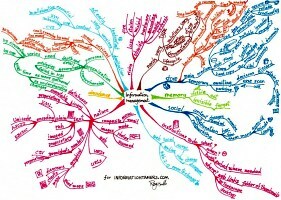 Here are some links to good starting points in WikIT: How to make a mind map; How to make a concept map; Uses of information maps; Types of information maps; and finally a link to the full list of contents of WikIT. If you’re a visual thinker and haven’t tried these techniques, here’s the opportunity to find out more! Roy Grubb is based in Hong Kong. He is a management consultant specializing in information systems and the use of visualization to manage information and business change.